Indian names: nagajemudu, nagadali (Andhra Pradesh); nagphana (Bengal); chorhathalo (Gujrat); nagphan, chhittarthor (Himachal Pradesh); hathhathoria, naghhana (Hindi); papaskalli, chappatigalli (Karnatka); palakakkali, nagamullu (Kerala); chapal (Maharashtra); nagophenia (Orissa); chittarthohar (Punjab); mahavriksha, vajrakantaka (Sanskrit); nagathali, sappathikalli (Tamilnadu). 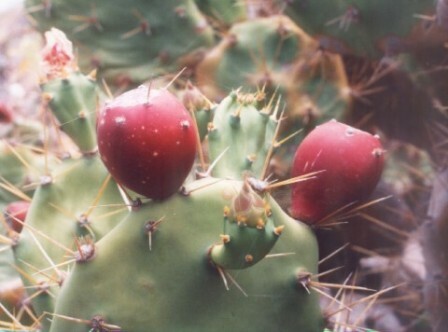 Chhitar thor opuntia is a xerophyte, generally found growing on the hill slopes in dry sunny areas, where there is hardly any other deep rooted plant. This bush has an exceptionally long flowering and fruiting season. It is adapted to rapid absorption and storage of water from the infrequent rains of the dry regions. The plant is covered with a thick cuticle which retards transpiration to a considerable extent. In this plant, the leaves are modified into spines, whereas the stem is modified into flat, spongy, leaf-like structures, with the water-storage tissues inside them. This plant is found wild in abundance in the Himalayas up to 1,500 metres. Most botanists consider this plant to be a native of India, whereas a few believe it to be of American origin. A succulent shrub, growing under desert and dry conditions; the stem and branches. which are green, and become flattened and look very much like leaves, are called phylloclade; height, 1 to 1.8 metres; internodes, 15.2 cm long. 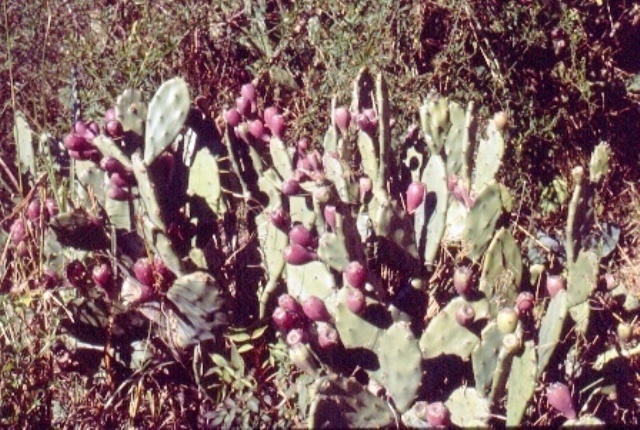 Leaves are modified into spines, and their function is taken up by the leaf-like stem; the modified leaves aggregate to form groups of fine bristles, called areoles; the areoles are prickly, the largest one is very stout, sharp and about 2 cm in length; there are about 35 areoles per internode. Flowers, yellow, complete, hermaphrodite, cyclic, epigynous, actinomorphic, 5 to 6 cm in diameter epicalyx with 4 sepals, green, 1.7 cm long, 1.8 cm broad calyx, polysepalous, with 4 sepals, yellowish green, 8 mm long, 1.2 cm broad; corolla, polypetalous, with 12 petals, regular, superior, Chinese yellow 606, 3.2 cm long, 1.5 cm broad; androecium polyandrous, infinite (with 380 to 450 stamens); versatile, stamens unequal in length (each 8 to 13 mm); gynoecium having an eight-lobed stigma, each lobe about 6 mm long, style 2 cm long; ovary, inferior; ovules, numerous. There are around 15 flowers on the topmost internode. each flower arising from the axil of a scale leaf which falls off earlier, leaving behind a scar at the base. 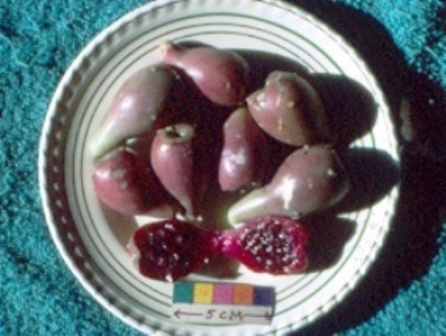 Fruits, fleshy, almost berry-like, pyriform, depressed at the apex, 6.1 cm long, 3.1 cm in diameter; weight, 24.92 g; volume, 24.00 ml; colour, rose Bengal 25; pulp, very mucilaginous; Fuchsia purple 28; juice, Rhodamine purple 29/2. Seeds, flat to comma-shaped, about 125 in each fruit, 4 to 5 mm in diameter; weight, 23 mg; volume, 25 microlitres. 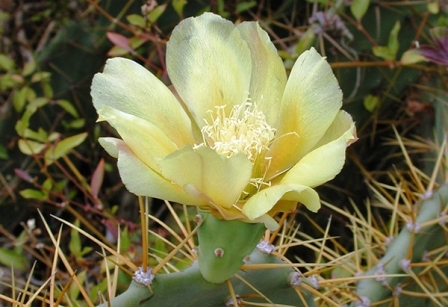 Under Solan conditions, the bushes of chhittar thor Opuntia keep on putting forth flowers for a very long period. The overall flowering season was observed to continue from the second week of May to the middle of August. However the peak flowering was noted during the third week of May to the first week of June. Similarly, the fruiting season is also exceptionally long. It started in November, and continued up to February. Some fruits could be seen on the bushes even up to the end of April. A bush spreading over 2.5 m2 yields about 2.5 kg of fruits annually. The edible portion of the fruit contains 78.5 per cent moisture. The mucilaginous juice of the fruit contains 10.8 per cent total soluble solids, 6.36 per cent acidity, 5.41 per cent total sugars, most of which are reducing sugars. The tannin and pectin content of the edible portion of the fruit is 0.11 and 0.24 per cent respectively. The vitamin C content of this fruit is 10.38 mg per 100 g of the fruit pulp. The minerals content of the edible portion of the fruit, as represented by ash, is 0.757 per cent. The protein content is 0.45 g, whereas phosphorus is 0.025 g; potassium, 0.458 g; calcium, 0.242 g; magnesium, 0.288 g; and iron 0.007 g per hundred g of the edible portion. The fruits are mucilaginous, edible and sweet, with a pleasant blend of acidity. The hairs create difficulty in handling as well as in eating these fruits and have to be removed before eating, The overall fruit quality is fair to good. The fruits are edible and are said to be used as food during scarcity. An alcoholic drink can also be prepared from them. The colour of the pulp as well as of the juice is very attractive. A very good jam was prepared from this fruit during the course of the present investigation. 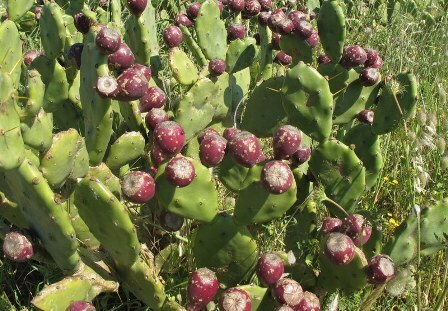 The only problem faced during the utilization of these fruits is the presence of fine hairy spines on the outer surface. These spines stick to the skin and cause irritation. They make the handling of these fruits too difficult. The hairs can be removed to a considerable extent by boiling the fruits. However, better methods are needed to be standardized for the removal of hairs from the fruits. The fruits have a very good keeping quality even under normal storage. The roots of this plant are very bitter. The underground roots are used for inducing quick vomiting in the case of persons bitten by poisonous snakes.